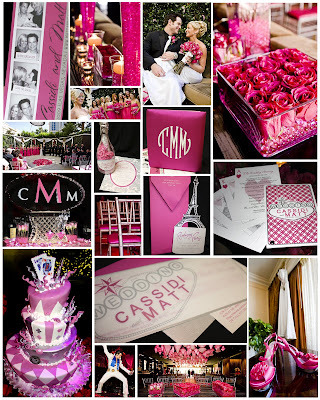 We just adore the vibrant combination of pink and silver for this outrageously fun Wedding in Las Vegas, Nevada! Starting with the Photobooth Save the Date, to the Champagne Bachelorette, to the Eiffel Tower Welcome Party, The Invitation to the Wedding itself, and the "Royal Flush" Wedding Programs, Everything we did for the Wedding had such a fun twist! Congratulations, Cassidi and Matt! We loved working with you!